On 12th December, Ambassador Deng Ying met with Danish Maritime Managing Director, Ms. Jenny N. Braat. The two sides held friendly conversation. Ms. Braat said she visited China for several times and China is one of the most important markets to Danish maritime companies. She is satisfied to see that the two countries had very good cooperation in this field. Ambassador Deng briefed Ms. Braat China’s measures to further open its market, the first China International Import Expo and significant achievements made by the two countries at the 10th anniversary of China-Denmark Comprehensive Strategic Partnership. 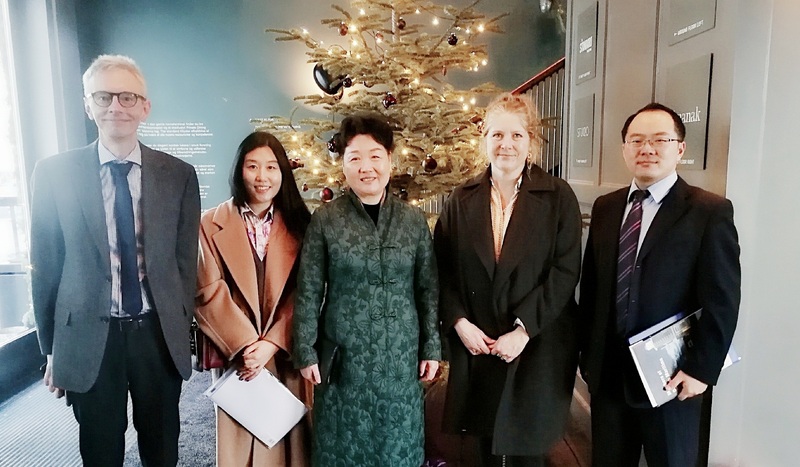 Ambassador Deng encouraged the Danish maritime companies to strengthen their cooperation with China and make greater contributions to China-Denmark economic and commercial development.